Spring is officially here! And what better way to celebrate the warmer temperatures than with ice cream! Here is a recipe of a homemade ice cream made with only TWO ingredients and which does not require the use of an ice-cream maker. 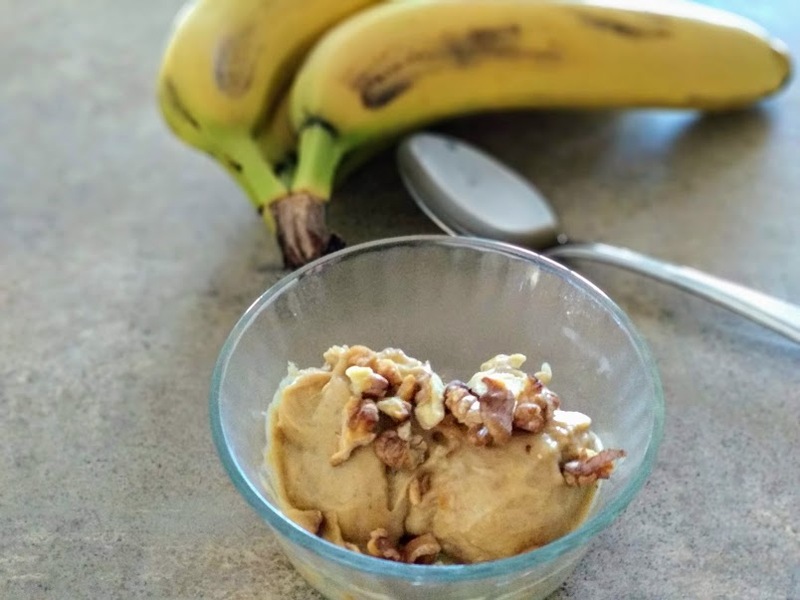 This ice cream is a great way to make use of your ripe bananas especially if you want a change from the classic banana bread! It can be served as a dessert or even for a snack. I topped mine with roasted walnuts to add some crunch but you can customize the toppings according to your preferences. 1. Peel the banana and slice into 1 inch thick circles. Place the sliced banana in a container and freeze for 2 to 3 hours. 2. In a food processor, place the banana slices and the peanut butter and blend until you get a smooth consistency. 3. Serve in a bowl with the toppings of your choice and enjoy! 4. You can also make a chocolate-flavoured ice cream by adding 2 teaspoons of cocoa powder to the banana and the peanut butter before blending the mixture.